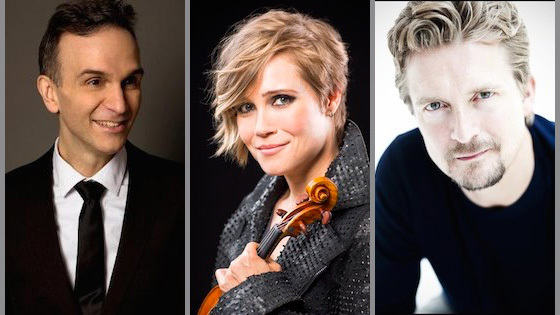 December 6, 2016, 10:21 AM · Congratulations to violinists Leila Josefowicz, Christian Tetzlaff and Gil Shaham, who are among the classical musicians nominated for 2017 Grammys! Nominees were announced Tuesday morning by the Recording Academy. Here is a complete list of nominees for the 59th Annual Grammy Awards. 2017 Grammy nominees Gil Shaham, Leila Josefowicz and Christian Tetzlaff. Of the 84 categories, there are eight designated for Classical Music. To see specifically the classical nominees, click here. Nominees were chosen from more than 22,000 submissions, selected by The Recording Academy's voting membership, who represent various genres and creative disciplines, including recording artists, songwriters, producers, mixers, and engineers. The Recording Academy will present the 59th GRAMMY Awards on Sunday, Feb. 12, 2017, live from Staples Center in Los Angeles, broadcast on CBS.